FRANK Vajda was just nine when he and his mother were lined up in front of a machine gun with about 30 other Jewish Hungarians, waiting to be shot by members of the pro-Nazi Arrow Cross Party. 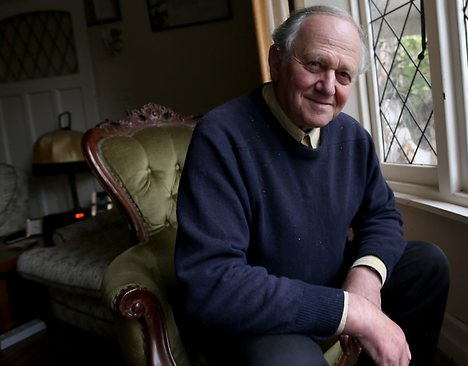 Now 77 and a professor of neurology in Melbourne, he remembers Swedish diplomat Raoul Wallenberg arriving to confront the execution squad and eventually persuading its commanders that he was entitled to take the Jews away. "Wallenberg was probably the greatest humanitarian of the 20th century," says Professor Vajda. He and his mother, Marie, survived the war and eventually made it to Australia. After the war, Wallenberg was arrested by the Russian secret police and disappeared into one of Stalin's prison camps. For decades Professor Vajda campaigned to have the Swedish hero freed and then, when it was clear he could not have survived, to have his heroism recognised. Julia Gillard responded yesterday by announcing Wallenberg would be recognised as an honorary Australian citizen, the first time Australia had bestowed such an honour. The Prime Minister said Wallenberg's extraordinary heroism saved tens of thousands of Jews from the Holocaust by issuing protective passports and providing shelter for them in diplomatic buildings. Professor Vajda said last night the bestowal of honorary citizenship was a wonderful gesture. He said Wallenberg had shown "tremendous, self-sacrificing guts". The diplomat was not himself Jewish but a Lutheran by religion. "But he sacrificed his life to save thousands of helpless people," Professor Vajda said. "He was a remarkably brave man." Welcoming the recognition, Tony Abbott echoed the words of Jewish MP Josh Frydenberg, who told parliament recently Wallenberg's courage "will always represent a beam of light in what was one of the darkest periods in the history of mankind". Wallenberg has already been recognised as an honorary citizen of the US, Canada, Hungary and Israel. He was awarded the honour of Righteous among the Nations by Yad Vashem, the Jewish people's living memorial to the Holocaust. "The lives of those he rescued are Mr Wallenberg's greatest memorial and Australia is honoured to have survivors he rescued living in Australia today," Ms Gillard said. The granting of citizenship will be marked by Governor-General Quentin Bryce on May 6, the 100th anniversary of Wallenberg's birth.